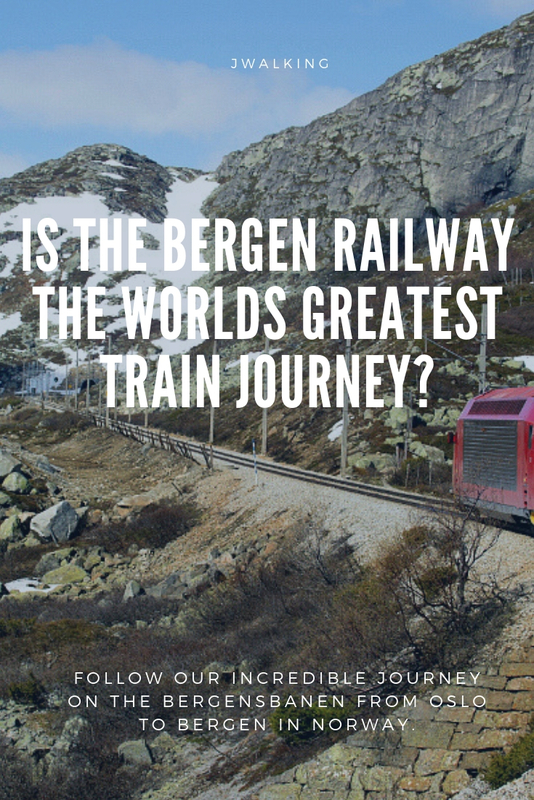 The Bergen tourist office claim that the Bergensbanen is “One of the worlds most beautiful train rides” but they would wouldn’t they? 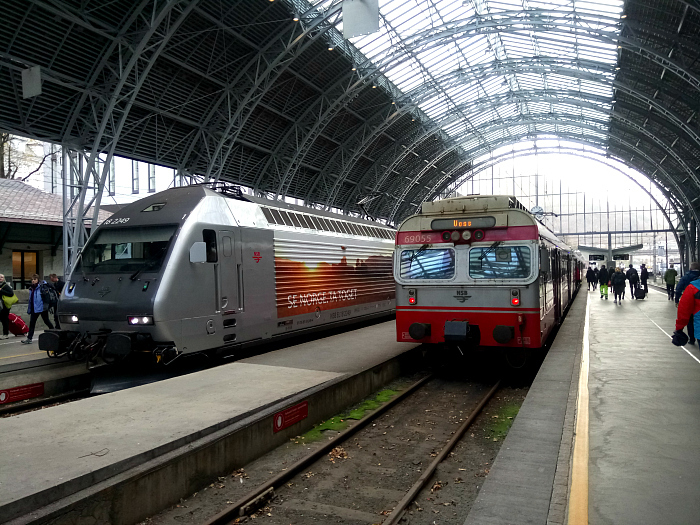 Lonely Planet asks whether it’s “Europe’s best train journey?” whereas the Guardian declares it as “one of the world’s best long-distance rail journeys“. High praise indeed and it seemed to us that there was just no better way to get from Oslo to Bergen. 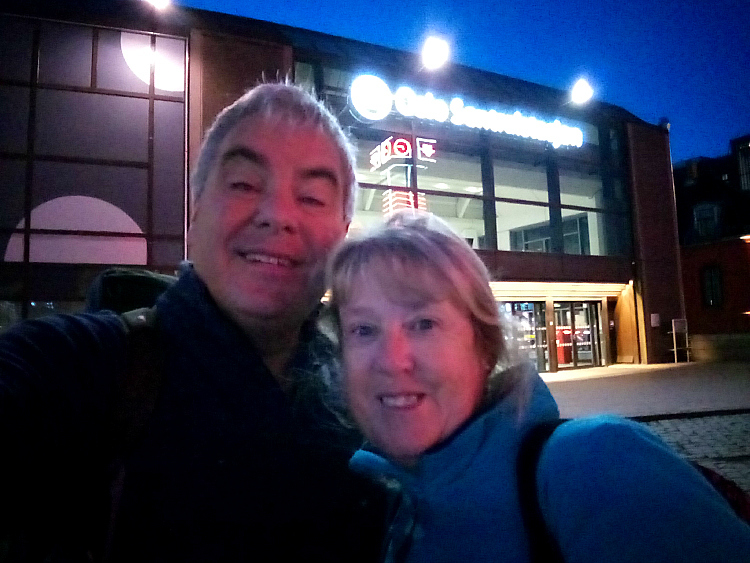 As usual we went for the early train so had to be up and away from the Anker Hotel by half past six which meant an even earlier start if we were to get our three plates of buffet breakfast (Norwegian Adventures in Oslo). Dry and bright weather forecast thank goodness as we hiked into city centre and found the main Oslo S station where our journey would start. Bit of background information on what this railway line is all about first though. 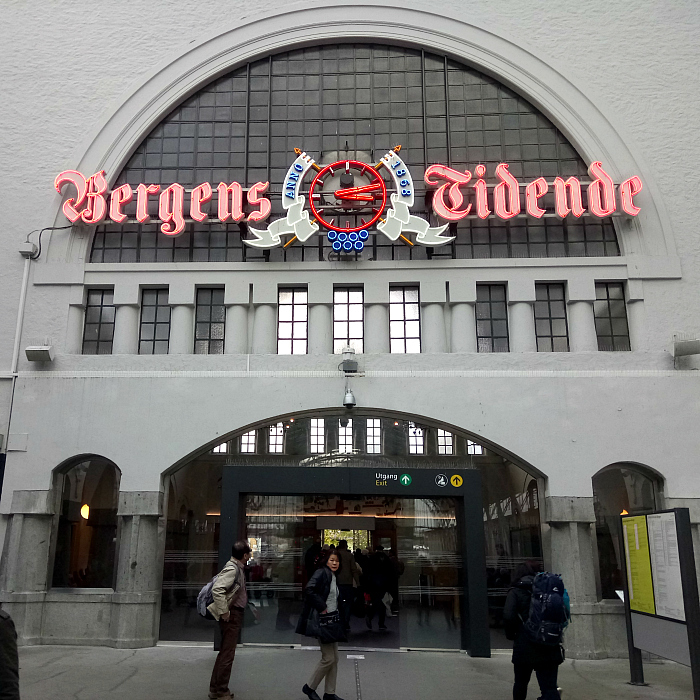 The Bergen Railway, or the Bergensbanen as it’s known in Norway, is a 308 mile (497 km) passenger train that runs between Oslo and Bergen. Construction started in 1883 but the whole length wasn’t completed until 1909 with the line being electrified in the early 1960s. 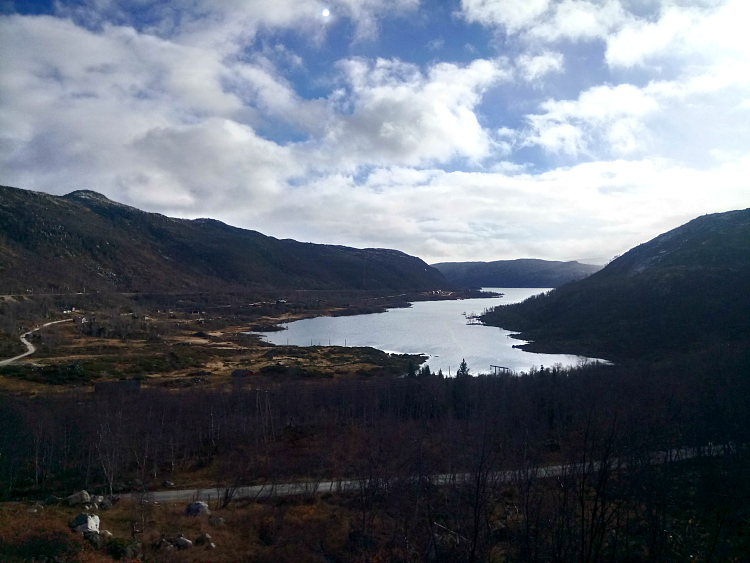 It is the highest mainline railway in Europe with it’s highest point being the Hardangervidda plateau at 4,058 feet (1237 metres) above sea level. Considering that it starts and ends at virtually sea level it’s a huge climb and descent. The seven hour journey takes you through some of the worlds greatest scenery and through 182 tunnels. It’s mind-boggling that the track was ever built to be honest as the terrain is seriously unforgiving. From the map below you can see that the route takes you from the Norwegian capital in the south east right across to Bergen on the west coast. 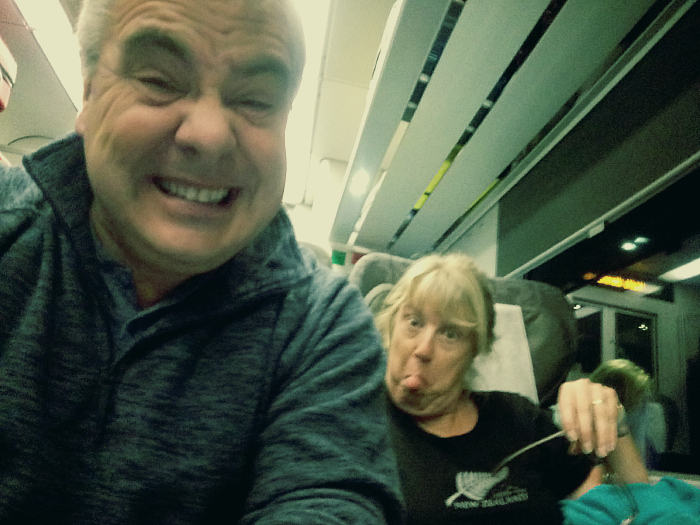 As regular followers of our blog will know we really enjoy travelling by train and absolutely love a classic long train trip such as our journey from San Francisco to Chicago on the California Zephyr (Rocky Mountain Way on the California Zephyr). 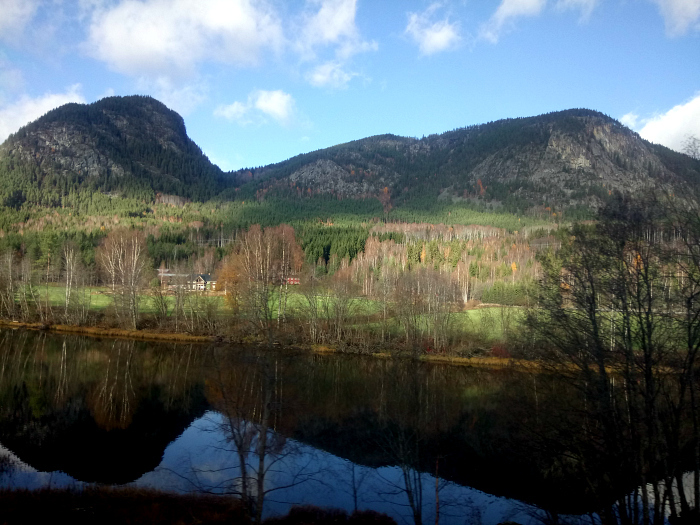 So when we were planning our Norwegian trip we just couldn’t resist the Bergensbanen. So how would this rank alongside that epic experience? 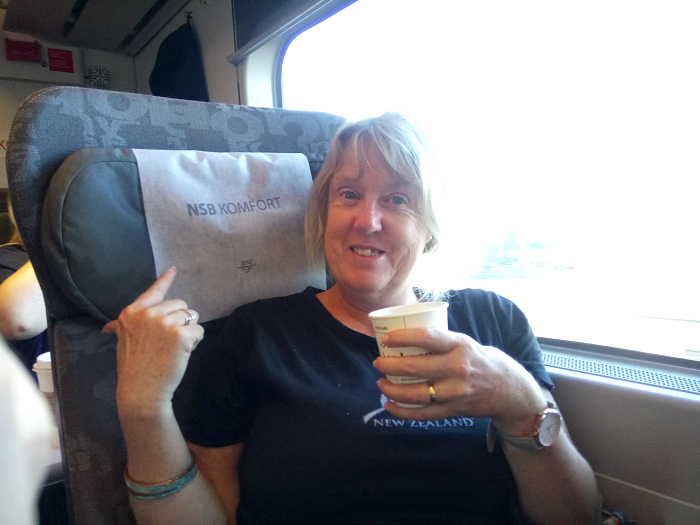 We’d booked our tickets with NSB and had made the rash decision to upgrade to ‘Comfort‘ class. Not much more but apparently with more leg room, free tea and coffee, and a quieter child-free carriage. Obviously on-time to the minute we found our seats and settled as our fellow passengers milled around getting themselves sorted out. Now we’ve always loved ‘people-watching’ so a major part of any trip like this is just to enjoy getting to know our fellow passengers and watch their antics along the way. 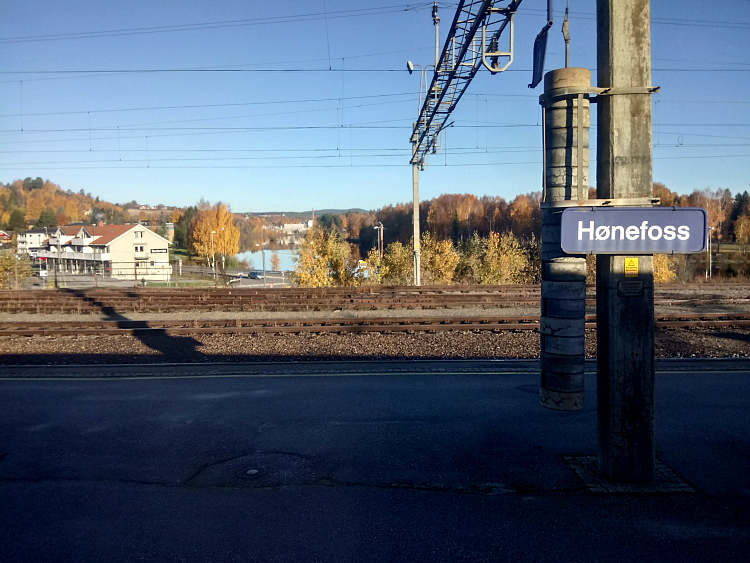 The train crept reasonably slowly through the suburbs as it left Oslo on the way to our first major stop at Drammen. That was where we left civilisation and headed out into the wilderness. The sun was shining and we had beautiful blue skies as we headed on up towards Honefoss. A few of our fellow passengers seemed to be busy on their laptops or more interested in the free coffee but we just couldn’t get enough of the spectacular scenery on both sides of the train. 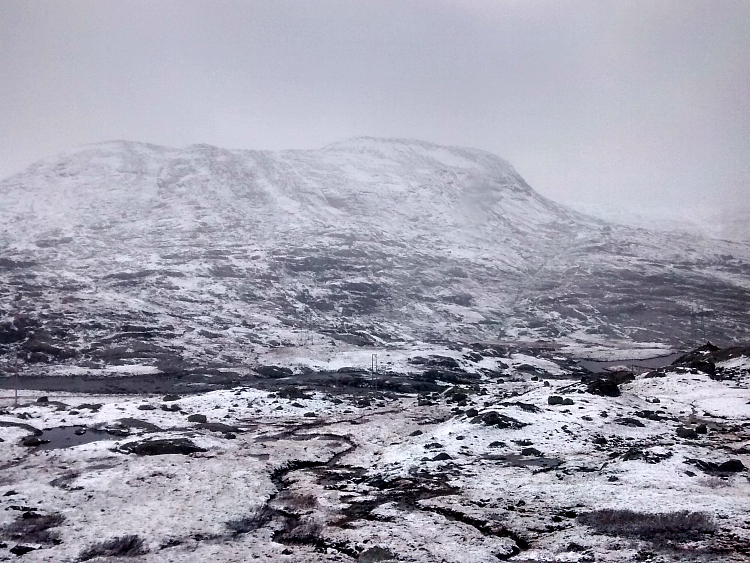 The track twisted alongside fjords and through valleys past snow-tipped mountains as it climbed higher and higher. In the carriage with us were a couple of Germans who seemed more interested in what we were doing than the scenery, some Canadian ladies who had been everywhere and just wanted to outdo one-another with their travel tales, a Norwegian couple who had serious problems finding their seats everytime they wandered off, some very very loud Americans who knew it all, another British couple who sadly never spoke to each other with the wife constantly on her laptop, and our favourites an older Indian couple. Why favourites? Well they just never got used to the fact that the train actually moved and kept falling in other passengers laps and throwing coffee everywhere. Plus the guy held a camcorder which he used for the whole trip. He kept filming as he collapsed on top of the Canadian ladies, tried unsuccessfully to carry cups of tea, and even flattened me against the window in the corridor. Hilarious. Stopping at strangely names stations such as Fla, Nesbyen, Gol and Geilo we were almost at the highest point of the journey as we approached Finse the highest station on the line at around 1222m. The weather had closed in as we climbed and the blue skies had been replaced by thick dark clouds and unbelievably light snow. 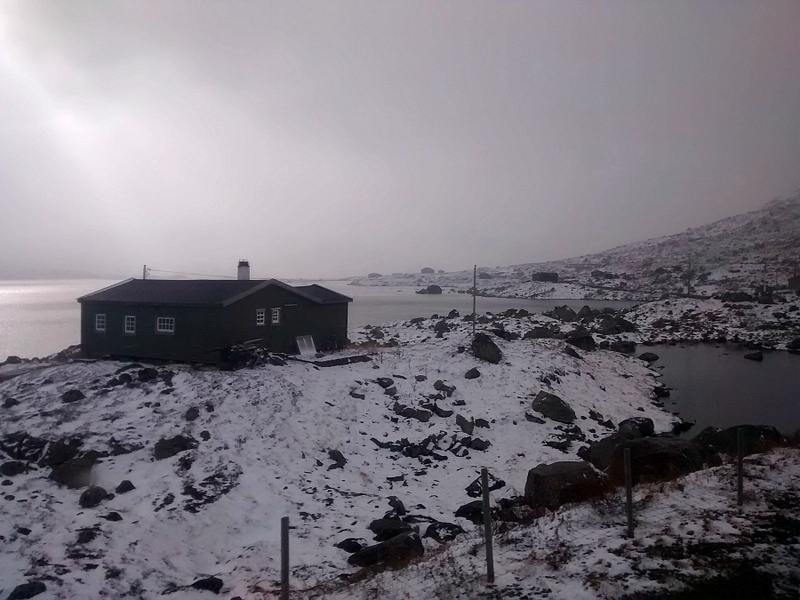 Between Finse and Myrdal we travelled through a snow-covered wasteland that almost looked like another world. The occasional wooden hut sitting miles from anywhere alongside a fjord was the only sign of life as unbelievably beautiful scenery welcomed us on all sides. Truly unbelievable and as we pulled into Myrdal I just couldn’t resist jumping off for a quick snowy walk along the platform. 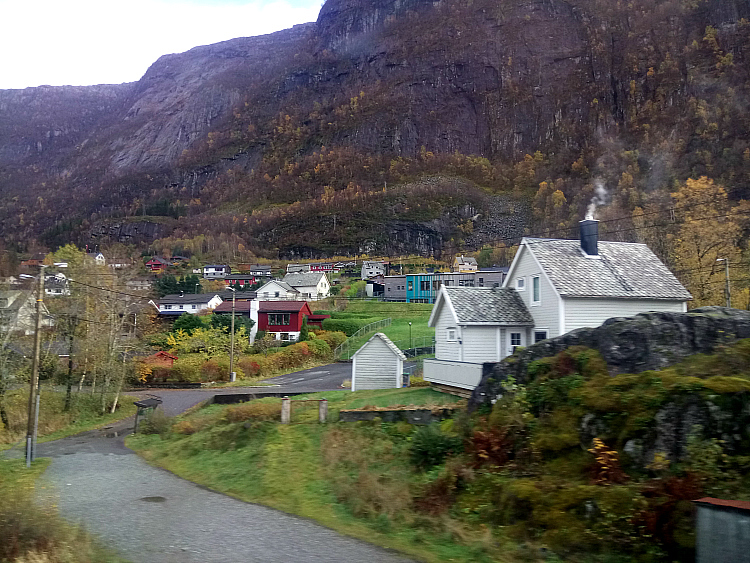 At Myrdal the only branchline connecting the Bergensbanen is the Flam Line. This runs north to the town of Flam where several fjord cruises start on Sognefjord. Many of our fellow travellers, particularly the Americans, were leaving us here to take the Flam line and catch one of those cruises, thank goodness. We heard every detail as they discussed their itineraries in extremely loud voices trying to outdo one another as we arrived. It actually sounded like a great trip so we’ve banked the information for next time. The other British couple hardly looked up and the Indians just kept filming each other falling over. Leaving Flam the train descended fairly quickly out of the glacial wilderness and started it’s way down towards the sea at Bergen. Scenery changed dramatically as the ice and snow withdrew and we dropped into greener valleys. A few passengers were dozing at this stage but we as usual couldn’t contain our excitement. Stopping at Voss and Dale we were almost at the end of the journey and we desperately didn’t want it to end. As much as we were looking forward to seeing Bergen and experiencing what it had to offer we were loving the train far too much. 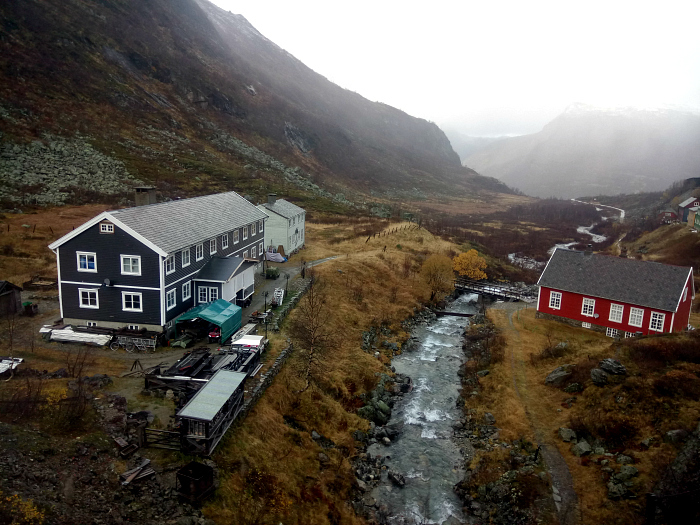 We even spoke about whether we could do the return trip to Myrdal and back the following day! Crazy talk. Before long the train was pulling in Bergen station and the end of our journey. It hadn’t felt like anywhere near seven hours as there had been so much to see and the time flew by. 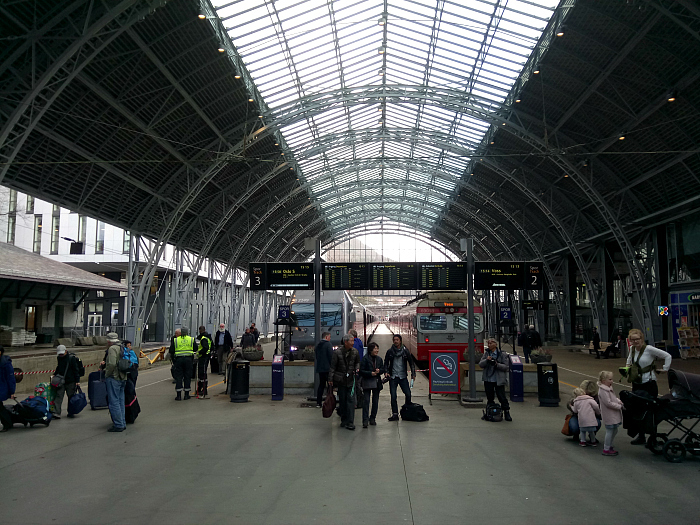 We couldn’t believe the change in temperature as we stepped onto the platform as it was a good ten degrees colder than when we had left Oslo. Tough one for us to answer as we obviously haven’t been on all of the worlds top train trips but it was a stunningly spectacular journey that must be difficult to match anywhere. From our limited experience we would probably say that it was the best train trip we have ever taken. Unbelievable and unforgettable. Well I’ve just shared this with my hubby and he was like wow! He’s desperate to do the Canadian route and we often used the trains to move around when we were in Czech. The train to both Austria and Germany was stunning scenically. We loved getting trains through Germany and Austria, all so scenic. This Bergen one was something else though, very special. Jonno these views are beyond dazzling. I see why it is one of the best train rides on earth. Reminds me of some views I enjoyed in New Zealand. Thanks Ryan. It’s so reminiscent of south island New Zealand, we kept saying exactly the same. Just an incredible trip, pushes the California Zephyr very close. Looks great. I may be going to Norway after my house sit in Scotland so that would be early June. I have friends in Voss. Did you do this trip with a train pass??? Or a one day ticket?? I am thinking of getting. the Scandinavia pass for 3 or 4 days and travel to a few places after visiting the friends in Voss. So, happy to see you are in this neck of the woods and any advice you can give me is greatly appreciated. We just booked a one way ticket online on the NSB site, not that pricey either. Seriously recommend you do the trip if you can as it was so good. 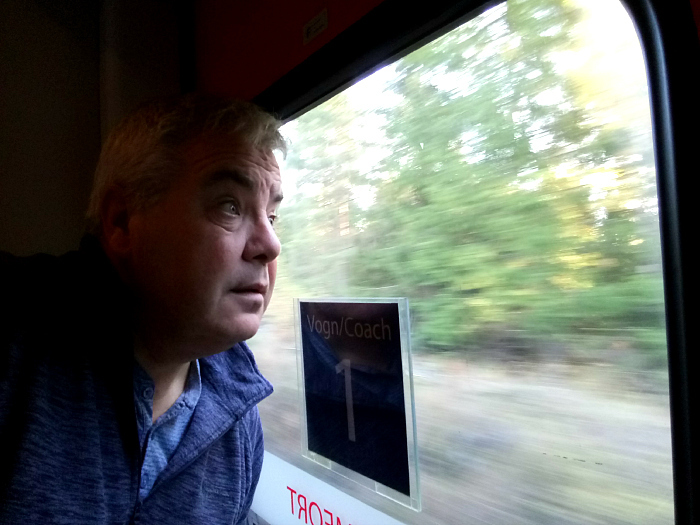 Thanks and I am hoping to do it and possibly do a couple other train trips in Scandinavia so was looking at the rail pass that allows 3 or 4 days travel with hop on and off each 24 hr period. But, If I did not want to hop on and off and only want to go to specific towns then maybe better to buy separate tickets ??? I’m not sure how much the extended passes are so you may need to do a little research there. Sometimes with those passes you don;t end up using them as much as you think. About a decade ago, my parents and I traveled from Oslo to Bergen to meet our Norwegian cousins for the first time. We were there for Christmas, and the landscape was iced over, but beautiful. I’d like to make the trip during the warmer months, and go see the fjords, as well. Was this your first time to Norway? First trip to Norway and hopefully not the last as the scenery was fabulous. 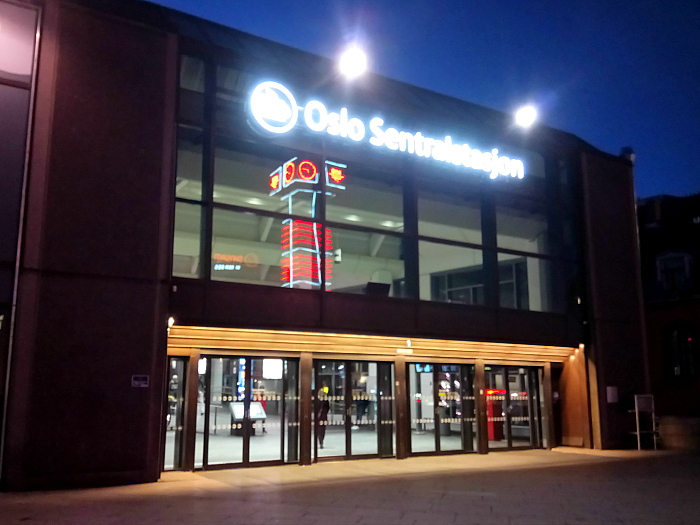 Probably wouldn’t go to Oslo again but some of the smaller towns up the west coast look great. I bet Christmas was wonderful there? They were awesome weren’t they? We didn’t know whether to look left or right most of the time, it was an incredible trip. To be honest I’m not sure what I enjoyed more. 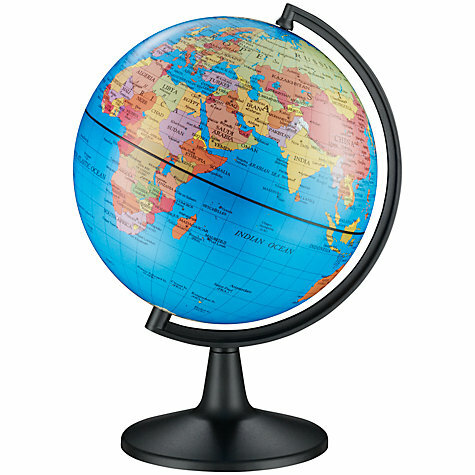 The description of the scenery or the international shenanigans of the passengers. You are a great storyteller and I couldn’t help but giggle on several occasions. Norway is high on our list and I keep notes of things for the itinerary. I’ve just added this one to the list! Ah thanks Sue. It was touch and go on this post whether I just wrote a daft story featuring all the characters onboard or whether it was a proper travel post. Sort of ended up half and half. I think that combination sets an article apart. Happy you settled on the combination. Oh wow! That sounds like an amazing trip. The pictures are fabulous too. There is nothing like a great journey by train! Thanks Nick. You’re so right, nothing beats a great train journey. We love em. Thanks so much for the kind comment Alison. 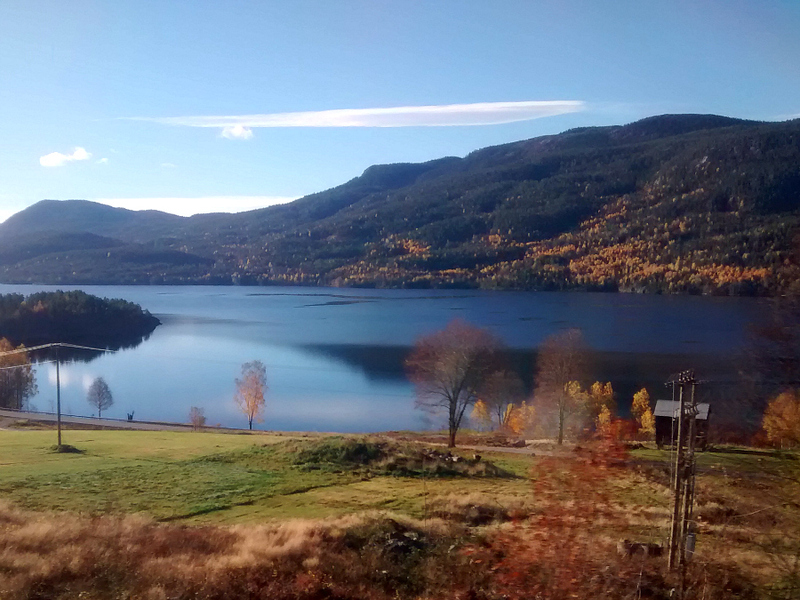 The train journey was spectacular and you’ll be able to read all about Bergen in Jo’s next post. It sounds like a rail trip into paradise! Even with free entertainment thrown in! It was exactly that. Could’ve jumped back on and done the whole trip again! It looks that you had a great time in Train and you have shared a nice post on your experience. Thanks for reading, it was a terrific experience that we will never ever forget. I wonder what Michael Portillo would make of it? I don’t remember him doing that one. We are looking at going on the Bernina Express from Chur in Switzerland to Tirano in Italy but can’t decide whether to do it winter or summer as the scenery is so different. Don’t understand folk who book to travel on a super scenic rail journey then spend all the time on a laptop, Crazy. The Bernina Express is supposed to be fantastic, i bet both times of year would be equally great. Making note of this for any future trip to Norway. You’d absolutely love it. A definite for any Norwegian adventure. It was more than amazing, brilliant in fact. Lots of weirdly named places too so you’d feel right at home! 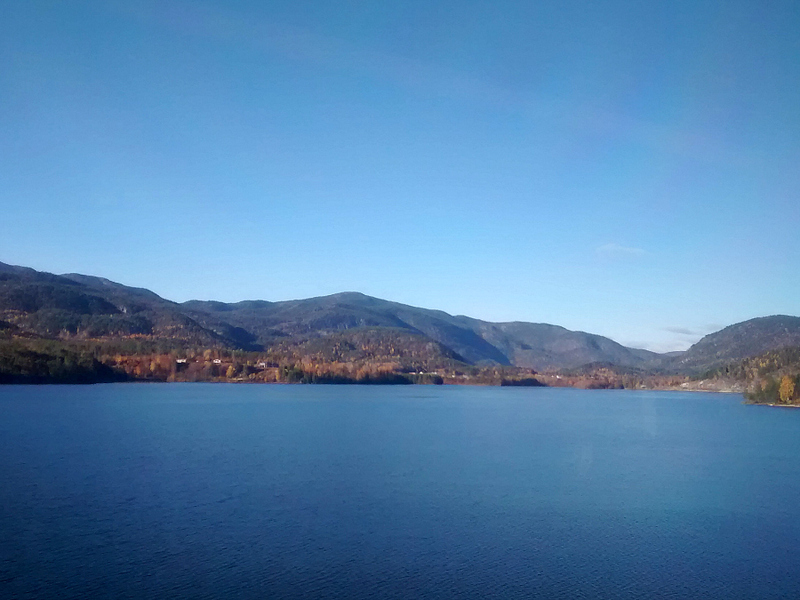 I love a scenic railway journey – train is one of my favourite ways to travel. 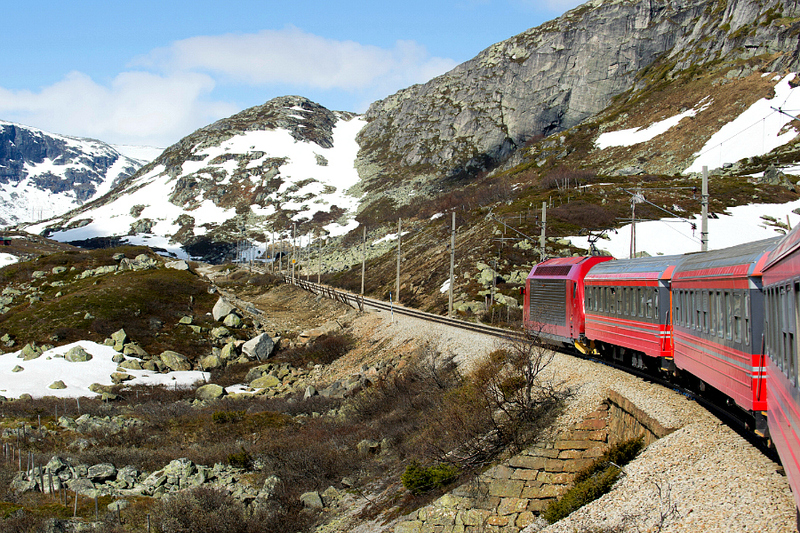 I’d definitely like to do the Bergen Railway as the scenery looks absolutely stunning! It was amazing Kate, if you ever get the chance it’s worth doing. Looks really spectacular! Travelling in style. Unbelievably brilliant and so stylish.